MIAMI BLUES: A Cult Crime Flick With A-Movie Chops – Schlockmania! George Armitage isn’t mentioned often during discussions of the graduates of Roger Corman’s filmmaking boot camp but he’s worthy of notice. He’s best known to most viewers for the oddball John Cusack vehicle Grosse Pointe Blank but he’s also directed deep-catalog cult faves like Hit Man and Vengeance Force. Miami Blues represented his return to directing in 1990 after a long break and it’s a nice showcase of his quirky but compelling style. Adapted from a Charles Willeford novel, Miami Blues is a tale of a crook and a cop. 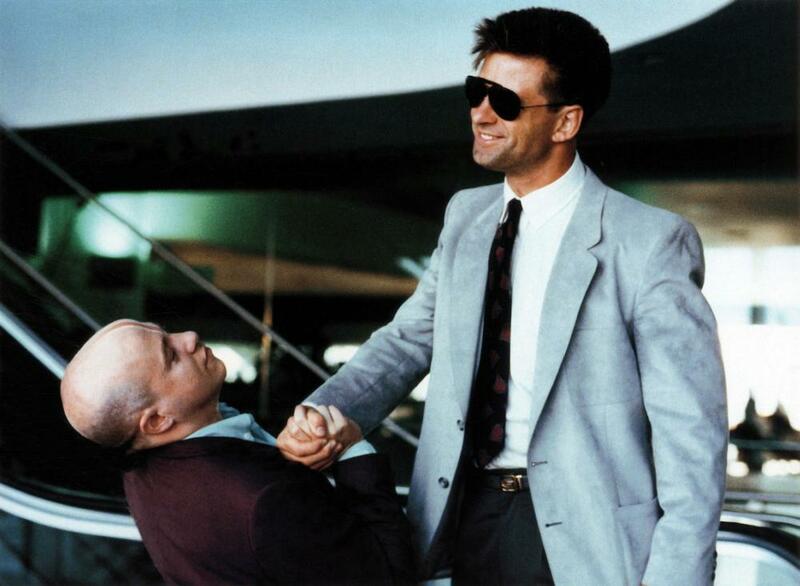 The crook is Fred “Junior” Frenger (Alec Baldwin), an ex-con who descends upon Miami and pursues a one-man crime spree. He picks up a girlfriend in part-time prostitute Susie (Jennifer Jason Leigh) and pulls up a variety of small-time stickups. 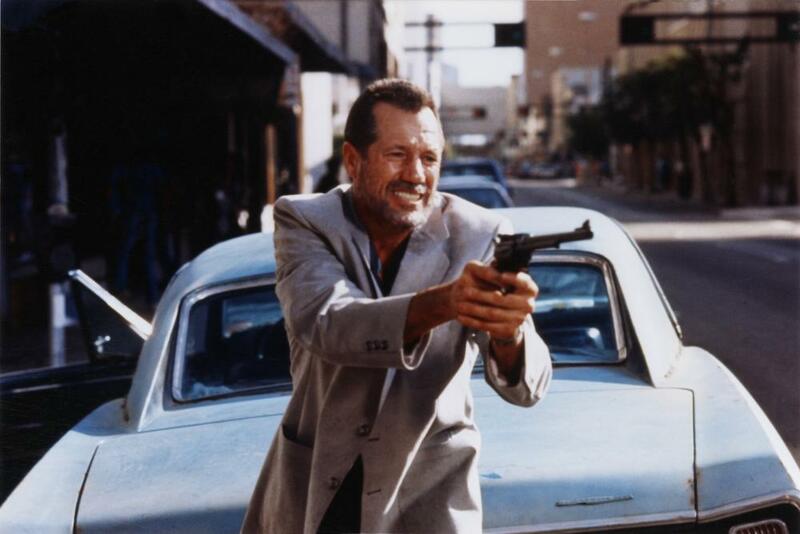 His handiwork quickly arouses the suspicion of grizzed detective Hoke Moseley (Fred Ward) but Junior gets the drop on him, stealing his badge and gun. Hoke now has double the reason to pursue Junior, setting in motion a course of events that are as lethal as they are darkly funny. 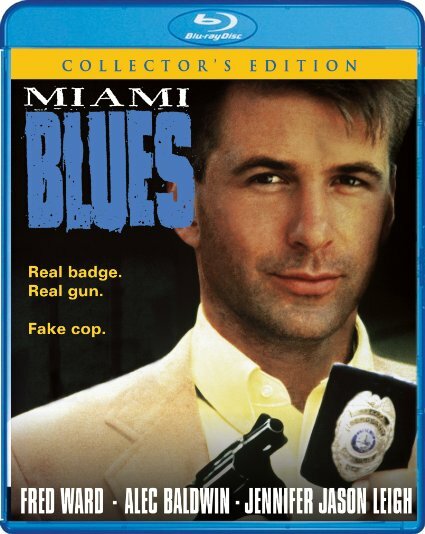 Miami Blues was marketed as an action comedy and while it fulfills both halves of that mashup genre, it does so in a playfully dark way that gleefully transcends mainstream expectations. Armitage’s script mixes brutality, violence and unexpected moments of tenderness in a way designed to keep the audience surprised at every turn. The characterizations are richly drawn from the leads down to the colorful bit-parts and the plotting defies expectations of conventional cop-and-crook fare to create something that reflects the unpredictability of fate and human nature. Armitage also does impressively stylish work in the director’s chair. Using some key above-the-line collaborators who normally work with producer Jonathan Demme – namely, cinematographer Tak Fujimoto and editor Craig McKay – Armitage gives the story a sunny visual gloss that acts as an effective contrast to its dark content and an urgency in the pacing that makes it as exciting as it is unpredictable. Gary Chang’s percussive musical score further amps up the excitement that Armitage and his crew create. Better yet, Armitage has a great cast to work with and has just the right touch to get them to give brave, unique performances. Baldwin clearly relishes one of his first lead roles and it gives him a wonderful venue to display two of his greatest skills as an actor: the ability to be frighteningly intense and a knack for madcap comedy. He deftly switches between these two styles as the story requires, often within the same scene, and the results are electric. Leigh provides a wonderful counterbalance with her turn as his girlfriend, displaying a touching vulnerability and also displaying great deadpan comedy chops. Ward does great work as the final part of the film’s central triumvirate, embracing the sleazy contours of his character with zero self-consciousness and finding ways to show the heart behind Hoke’s sleazy ways. There’s also a gallery of fun supporting roles filled by cult-fave character actors, including Charles Napier as a detective pal of Hoke’s, Shirley Stoler as a tough pawn-shop owner and Paul Gleason in a killer cameo as a sharp, mean vice cop on the take. Horror fans will want to look for quick bits from Martine Beswicke as an eye-rolling waitress and Day Of The Dead star Gary Klar as a bookie. In short, Miami Blues is a perfect example of a cult movie, applying a-movie chops and ambition to material that less ambitiou s filmmakers would consider b-movie material. It’s a shame that Armitage doesn’t do more directing and this film offers proof of the kind of skills he brings to the game. Blu-Ray Notes: This title was just reissued by Shout! Factory in hi-def form. The transfer looks nice, capturing the film’s naturally-lit style with nice depth and color. The stereo track is presented in lossless form and sounds suitably robust and well-mixed. The trailer, which soft-pedals the film’s eccentric edges for a mainstream crowd, is included. There is also a new featurette that intercuts new interviews with Baldwin and Leigh. Both offer a sophisticated analysis of their characters and their relationship as well as tales about Ward and Armitage. Baldwin’s closing story about the machete scene is quite funny. In short, it’s a worthwhile update that the film’s fans will want to get.